The year was 1956. Don Larsen pitched a perfect game in the World Series, 'I Love Lucy' was the top rated TV show and kids everywhere were treasuring, trading and flipping their Topps Baseball cards. Little did these kids know that one day this particular baseball card set would go down in hobby history as one of the all-time greats. 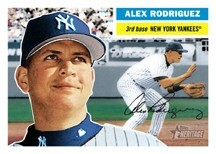 And now Topps and collectors will relive the magic of 1956 with the award winning Topps Heritage Baseball. 2005 Topps Heritage, celebrating today's stars on the classic 1956 Topps design, features a stunning base set that spans 475 cards. This set builder's dream has the look, the feel and even the smell of the original. The popular Chrome (#'d to 1956) and Refractor (#'d to 556) Parallels continue while an all-new Black Chrome Refractor (#'d to 56) makes its debut. And 'New Age Performers', 'Then and Now' and 'Flashbacks' Inserts return as well. A feature that draws Autograph Card collectors to Heritage - the beloved Real One Autographs, includes greats such as Hank, Duke, Yogi and Mr. Cub and players who were pictured on a Topps card for the last time in 1956. Each player has signed 200 cards in blue ink and an additional 56 cards in red ink. Topps has also seeded seven unique 1 of 1 cut signature cards featuring the likes of Dwight Eisenhower and other figures from 1956. And for the Relic Card fans, Heritage is stacked once again. Not only will Clubhouse Collection Relics and Flashbacks Relics feature the brightest stars in the game, but they will also include an autographed version numbered to 25. Clubhouse Collection will also include 3 Dual Relic Cards. And the best insert of them all - STICKS OF GUM - for your pack opening pleasure! 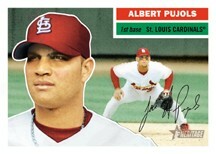 2005 Topps Heritage ships February 14th and carries a $3.00 SRP for each 8-card pack.